Cuban President Raul Castro traveled to Santiago de Cuba along several members of his cabinet to lead the organization of works to prepare the eastern Cuban provinces that are threatened by the powerful Hurricane Matthew. 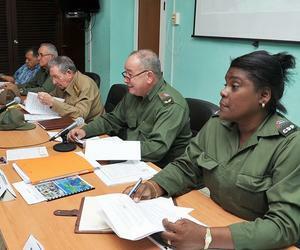 Raul, that once the Cuban Civil Defense is activated on the occasion of a natural disaster, becomes its President, set up a meeting with the top authorities in Santiago de Cuba to get a full report on the readiness of the province to face the category 4 Matthew. The ministers presented the strategies and plans set in place for this kind of events, and they reviewed the different stages of preparation on all the territories that will be battered by the storm according to forecasts. Santiago de Cuba´s Civil Defense president Lazaro Exposito said the government, party and population of the eastern city had learnt from the 2012 Hurricane Sandy, and have taken the appropriate measures to palliate the effects of Matthew in that region. Hurricane Matthew is now stationary south of the island of Jamaica, gaining in strength and organization. Its maximum sustained winds of 150 miles per hour, with stronger gusts. All forecasts point that it will move north towards Cuba in the next 72 hours.